Lipofuze is an American diet pill formulated to prevent binge eating by way of strong hunger blockers that convince the consumer’s stomach they are full, and strong fat burners that help melt away that spare tire. Lipofuze’s main ingredients are Green Coffee Bean Extract, Green Tea Extract, Irvingia Gabonensis, Caffeine, and CoEnzyme Q 10. But does the product really work? Our team of researchers and weight loss enthusiasts are perennially searching for new and intriguing products to review ­ so let’s take a closer look at Lipofuze! 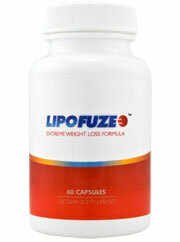 Lipofuze boldly claims to help consumers lose up to one pound a day with its powerful fat burners and hunger blockers. However, the most abundant ingredient in Lipofuze is caffeine. This fact made us immediately skeptical of a product boasting to melt off one pound a day. Although there are good ingredients in Lipofuze, common sense suggests it is quite unlikely that you’ll lose the weight the advertising states. Additionally, there are plenty of negative customer reviews reporting that Lipofuze made them vomit, have diarrhea, a ridiculously quickened heartbeat, and absolutely no weight loss whatsoever. Although individually the ingredients in Lipofuze have been tested and proven to help in weight reduction, as a whole Lipofuze has not been tested at all and it is very important to understand that individual results do not correlate with overall group results. Diet supplements involve many variables, unique processes, and believe it or not ­ chemistry. Therefore, just because Lipofuze has injected many favorable ingredients in one pill does not mean it is even remotely close to that of a miracle, lose­one­pound­a­day pill. Even more so, Lipofuze costs about $55 for a month’s supply ­ a fairly steep amount. However, on the bright side Lipofuze does offer a 90 day money back guarantee and in this regard we were impressed. Lastly, in conducting our research we were also dismayed to find that the ingredient properties in Lipofuze very closely match those in Apidexin, which is very closely tied to Abidexin ­ two other products that have received fairly unfavorable reviews. Therefore it appears Lipofuze is merely a derivative of other products that did not achieve satisfactory results with customers and underwent name changes. Despite Lipofuze’s promises and appearance as a quality product, in fact this could not be farther from the truth. Lipofuze is a diet pill that relies on interesting ingredients but no real collective clinical studies proving the product’s effectiveness on the whole. Moreover, in promising to help customers lose one pound a day, Lipofuze is simply making claims its product cannot cash. In our team’s recommendation, the consumer would be better off going with a diet supplement that incorporates a good fat burner in addition to a good fiber for quality hunger control. There is no need for several fat blockers and several hunger blockers all blended at unproven quantities, and drizzled over with plenty of caffeine like Lipofuze does. Bottom Line: There are plenty of good quality products for healthy substantial weight loss, but take our word for it ­ Lipofuze is not one of them. I am sorry to report that although it cuts the appetite I suffered from a horrible constipation since I start taking the product, and didn't lose an ounce obviously. So I stopped it.